The VAMO V5 Advanced Personal Vaporizer is sleek, powerful, reliable, full featured and very well built! The VAMO V5 has the same features as the V3, but the body of the V2. With the VAMO V5, Voltage or Wattage is variable 3.0-6.0 volts or 3.0-15.0 watts respectively, using a single 18350 IMR battery, OR, with the included extension tube, you can run a single 18650, or two 18350 IMR batteries. With the VAMO V5, you can check atomizer resistance and battery voltage too, with a long press of the small buttons. The VAMO V5 is single mode, which provides RMS voltage monitoring. The RMS mode is more accurate because, it samples the output Voltage repeatedly while it is powering an atomizer or cartomizer. With its 5 Amp output, the VAMO V5 has ample power to run whatever device you put on it. The buttons and settings are easy to figure out. This version has an easy to read OLED display. The VAMO V5 has a native 510/eGo connection, so it will run 510/eGo atomizers without adapters. Run 808 threaded devices as well, with an 808-510 adapter. The VAMO V5 requires one 18650 IMR battery, or one or two high power 18350 IMR batteries, available separately. It will work with flat OR button top IMR's and Hybrid 18650 batteries. The VAMO will work with the Panasonic NCR18650B 3400mAh Flat Top Battery and the Efest Purple IMR18650 2500mAh Flat Top Battery when used with a Flat Top Battery Adapter. Please note that the VAMO will NOT work with Efest 18650 3400mAh Batteries - these batteries too wide and will not fit. 1. Click the big button 5 times to turn the unit on (or off). 2. Pressing the - button for 3 seconds displays battery voltage. Pressing the + button for 3 seconds displays the working resistance. 3. Single pressing of the +/- will increase or reduce with 0.1V or 0.5W increments depending on power mode. 4. Press and hold down the + and - buttons at the same time to enter the Menu. Once in the menu the top right or + button will advance thru the menu and the top left or - button will change that menu setting. There are only 3 function settings in the Menu. Menu 1: Hold down both +/- buttons and it enters at Menu 1 and says Power/Voltage. Use the left button to set to either Voltage or Power output. Power output is beneficial in that regardless of your atomizer resistance, the unit will hold constant Power setting for the same vape. You forget about voltage as the unit adjusts that behind the scenes to hold the Power constant. Menu 2: Once in the Menu by holding +/- buttons advance to menu 2 by pressing the top right or + button. Menu 2 will say LCD Display and then pressing the top left or - button will allow you to switch what is shown on the screen while vaping. You can choose Power(voltage if set from menu 1), Resistance, or Battery. If set to power it will show your setting in Watts (or Voltage if output set to voltage) during vaping. 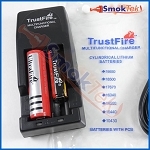 Resistance will show the Atomizer resistance, Battery just shows the current charge of your battery. 5. Press the big button to operate the unit. 6.To turn off, click the big button 5 times. 7. Battery monitoring shuts the unit off once battery has reached end of charge. 8. LCD displays LO-O if resistance lower than 1.2ohm, LO-V if short circuit. The price listed is for the body only, packaged in a simple box. Q: does this come with instructions? what tank or carto is recommended?